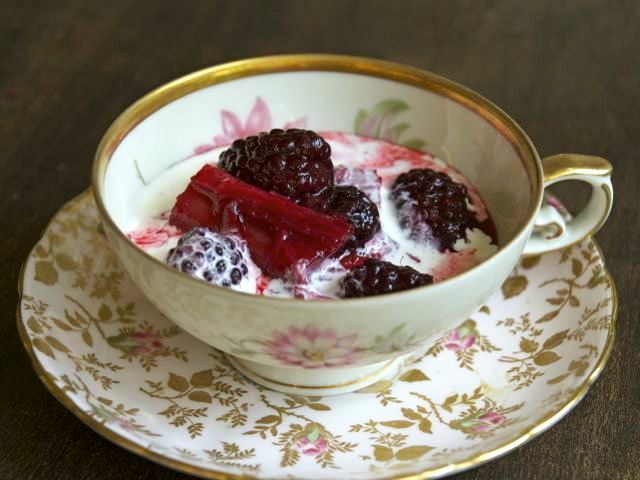 We tend to assign rhubarb to early spring and blackberries to mid-summer, but in the Pacific Northwest and other places as well, rhubarb is still producing vigorously when the blackberries and raspberries come in. Hence a summer rhubarb compote. In spring, though, use strawberries. Prepare the rhubarb. Bring the water to a boil with the sugar, cloves, and orange zest. Give a stir to dissolve the sugar, then reduce to a simmer, add the rhubarb, and cook it gently until it is just tender when pierced with a fork, 6 to 8 minutes. Lift the rhubarb out of the pan with a slotted spoon and put it in a roomy bowl. Add the blackberries to the syrup for 30 seconds, then lift them out too and add them to the rhubarb. Raise the heat, add the orange zest to the liquid, and boil until syrupy, when fine bubbles appear over the surface, about 10 minutes. When the syrup has reduced, let it cool for 15 minutes, then stir in the rosewater. Pour the syrup over the fruit. Cover and refrigerate. Serve chilled, plain, or with cream. Be sure to read Deborah Madison's article on cooking with local and seasonal produce.